Cards Against Humanity is a party game for horrible people. Unlike most of the party games you&apos;ve played before, Cards Against Humanity is as despicable and awkward as you and your friends. Usually, a expansion pack is part of the whole set. If you missed out on these when they came out, get them now. Easy and simple to play, nice to interact for party or family. The more people you have the more fun it is. Strengthen parent-child communication and relationship. 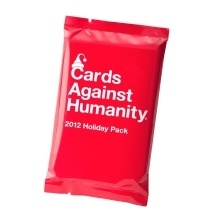 This is an expansion pack, requires original Cards Against Humanity set.